Cloud computing drives an increasing variety of online services, including popular SaaS (Software as a Service) offerings. In order to enable cloud computing, programs and data need to be taken off the local PC or mobile platform, and instead stored in this nebulous cloud, on a server in a location remote from the device accessing the resource. Delving deeper, there are three main types of clouds in cloud computing: public, private and hybrid. A public cloud provides cloud services to the public, whether to you personally, or to your organization, with the resources shared by many people. As they typically support multiple customers, they are considered less secure, and therefore less suited to sensitive information, such as confidential medical data for example. The resources are accessed over the internet, which becomes a requirement for use, so mission critical applications that cannot tolerate any internet connectivity downtime should not be put onto the public cloud. Public cloud solutions are available from the major tech behemoths, including Amazon Web Services, Google Cloud Platform and Microsoft Azure. At the other end of the spectrum is a private cloud solution. In this model, the shared computer resources are dedicated to one organization. An immediate advantage is that there can be much tighter security to limit access, making this well suited for more sensitive data that can comply with industry standard and security regulations which are imposed on such industries as the financial, medical or legal sectors (or any data that needs to remain classified). For a private cloud solution, the server can be on the company premises, known as a local server, or off premises, designated as a remote server. The resources on the server can be either owned directly by the company, or contracted via a vendor who sets up the software on the company server, and supports the company’s infrastructure through a contract. Now that we understand the two extremes of cloud solutions – public and private – we can more easily comprehend the middle option, known as hybrid cloud, which is a combination of a public and private cloud solution. 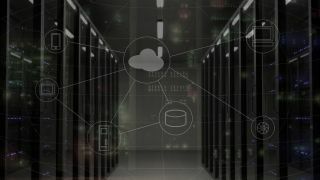 It can be thought of as connecting a public cloud to an in-house data center. Combining public and private clouds into a hybrid cloud brings its own set of pros and cons. The downside of a hybrid cloud is that it is a more complex undertaking with a blend of resources across multiple platforms, and that requires a higher level of knowledge to manage and support it. Another drawback of a hybrid cloud is that the cost is frequently higher than a public or private cloud setup as there are both the hardware costs of the private cloud, and the ongoing subscription fees of the public cloud. There are also security issues as the public portion of the hybrid cloud still has the multiple user security issues of a pure public cloud solution. There can also be latency concerns as data is shuffled between the private and public portions of the cloud. Attention must also be paid to the data center that supports the private cloud portion of the hybrid cloud, with appropriate choice of hardware in terms of the servers, storage, the network connecting everything, and load balancers for traffic management to keep it all running smoothly. However, the big upside is that a hybrid solution offers more choice in available resources, with the ability to use the best of each of the other solutions. It also offers a higher degree of scalability, with the potential to share resources as needed. Finally, the public cloud component facilitates easier access for mobile and remote workers with a hybrid cloud solution, compared to a private cloud-only solution. The ‘secret sauce’ to marry the public and private clouds into what the end user sees as one system depends on a virtualization layer, also known as a hypervisor. This virtualization layer supports the virtual machines (VMs) that access the resources on the hybrid cloud. Installed on top of the virtualization layer is another layer, called the cloud software layer. This higher layer provides the cloud capabilities to users. Due to the complexity of setting all this up, the services of a private cloud architect are employed. For example, a common challenge is the choice of a virtualization layer, and the cloud software layer to provide the proper compatibility to the target public cloud service. This will allow the desired services to migrate smoothly between the private cloud and the public cloud element, into the larger hybrid cloud ecosystem. This will in turn allow developers to create a service that draws on resources from both the public and private cloud components. A hybrid cloud is particularly well-suited to a dynamic workload situation. For example, a cloud service can run during normal business conditions on the company’s private cloud. In situations of peak demand, for example, during a busy time at a company when the need exceeds 100% of the resources of the private cloud, the overflow traffic can be directed to the public cloud portion. This ensures that things run smoothly without any interruption in availability. It is also cost-effective as the business only pays for the extra resources of the public cloud for the limited time that it is required, rather than paying to build out a more robust private cloud all year round, which is only used for a relatively small portion of time. In short, this is effectively additional capacity available on-demand, and it’s known as ‘cloud bursting’.